Living in the North East of England, I don’t get to many gigs in London so every opportunity is grasped with both hands. On this particular Saturday night there were three gigs that interested me and when I found out that The Arlenes were supporting Police Dog Hogan, my mind was made up. An attention-grabbing journey across the Capital on trains that go under the earth was made well worth it when I arrived at the 100 Club to discover that legendary pedal-steel player BJ Cole would be joining The Arlenes as their guest. I last saw the husband and wife Country duo 11 years ago and in the ensuing years Steph’s voice appeared to have got even stronger and Steve’s new songs much darker. Their version of California; that was originally bright and cheery and written naively before they emigrated to the State of the same name, sounded just as good but more world weary tonight and with hindsight was a highlight of an interesting set. As the Arlenes only ever recorded one album and that was a lifetime ago it’s been easy to forget how good their songs are – especially Lonely Won’t Leave Me Alone which is as good a Country song as a British writer ever wrote. Steph’s voice was wonderful as she squeezed out pathos by the bucket full and BJ Cole made the pedal-steel sound like an Angel crying. A couple of new songs, from an imminent CD were slid in too, and one; I Will Always Love Your Ghost, about the unhappy break up of a marriage was dark and brooding with a slightly Waltz like tune and was exceptional; but spoilt by the constant buzz of chatter all around the dance-floor. Another new song, My Brother Died Today was even darker and more sombre but what would you expect from a song about suicide? That said, it truly was beautiful. The set ended on a high note with a glorious version of Springboard and finally Springsteen’s State Trooper. Perhaps I was expecting too much from them, but the Arlenes weren’t quite as good as I’d remembered; but seeing and hearing BJ Cole got the evening off to a great start. While I’d enjoyed their recent album MIRACLES Police Dog Hogan, on the other hand were a revelation, on stage. Made up of five men; none of whom were in the first flush of youth, they won over a rowdy crowd of fans, tourists and music biz cognoscenti with ease. 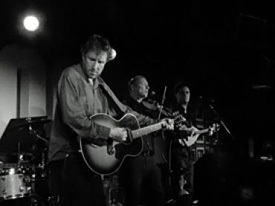 With a minimum of fuss the band launched into Hard from their debut album and without drawing breath continued into Devil Jim from LAND OF MIRACLES; which set the mood perfectly for a night of raucous Folk music. Not every song received an introduction; but those that did (usually when singer James Studholme needed to catch his breath) were very well told and captured the imagination. This was especially evident with one of my favourite songs,Fraserburgh Train which is told through the voice of a boy soldier who was heading to war; and the story alone was enough to catch your breath, but when followed by such a great song, I stood mesmerized for 5 solid minutes. As the gig flew by it was increasingly evident that all five band members had done this before with each one being an exceptional musician in their own rite, but when the talents are pooled together the result is simply amazing. Obviously the guitar playing was up to scratch but Pete Robinson’s Dobro playing was sublime and the interplay from fiddle and mandolin just can’t get any better than what I heard here plus the drum & bass of Michael Giri and Adam Bennette held all of the magic together in one danceable place. I’ve mentioned the word ‘Folk’ a couple of times already but that only goes a small way to describe Police Dog Hogan as they slid in a Cajun tune about the delights of mustard; while Steve Earle’s Galway Girl couldn’t have sounded anymore more Oirish if they’d been dressed as Leprechauns; and Oh Virginia it was Country Rock at it’s very best. Probably the highlight of the whole night was watching four drunken German tourists doing a hoe-down to I Saw The Light!It really was one of those nights as there was something for everyone and their ‘token’ love song, 14 Roses had the woman next to me wiping her eyes from start to finish. All in all this really was a memorable night at an iconic venue which was only topped off by missing the last train to my son’s house; where we were staying and having to get the night bus which is known locally as the ‘nutter bus’ and; boy did it live up to it’s name!